It has been a busy week here at Figgy Cottage. The Master bathroom demolition and renovation have begun, and we’ve moved downstairs for a while. I can’t wait to post the renovation news as we go—y’all know I love a good renovation project. Enough about renovations and more about these stunning flowers! Mr.P. sent these lovelies for my birthday last week! Have a wonderful weekend and check back next week for bathroom updates. Happy Belated Birthday to You!!! The flowers are so beautiful! There is nothing like an all white bouquet of gorgeous flowers. Cathy, Thank you so very much! It was a wonderful birthday—we had a house full of guest. Oh my goodness Mr. P should get a star for those! Woo Hoo he knows pretty flowers! 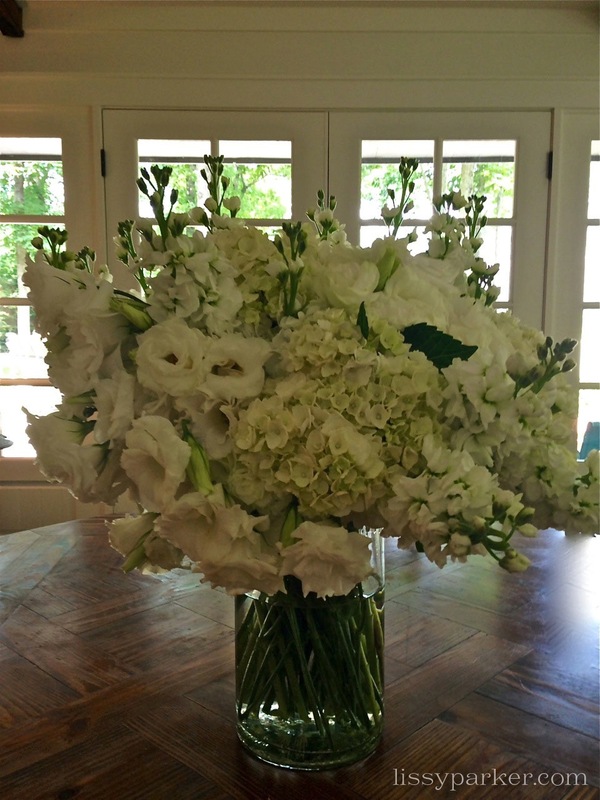 What a gorgeous arrangement – all whites are my favorite and I’m the biggest fan of hydrangeas. So excited to follow your remodel!! I love a one color arrangement too—so simple and beautiful. The reno is underway and the noise is encouraging—I hope!